We move this month to our site at Largo, which is a massive hit with everyone that attends, offering some breathtaking scenery whether it’s over the Fife countryside or out onto the Firth of Forth. With 3 completely different areas on the site ; “valley” “ski-slope” and “plateau”, we are able to offer you a good range of challenging sections throughout the day, usually finishing off with a trip to the trig point for a photo opportunity. It’s Easter of course, so there will be prizes throughout the day, for the kids (and even the big kids) to enjoy, bring a picnic and make a family day out! Time: 09.30 signing on and scrutineering, ready to start at 10.00Lunch: Bring your own packed lunch and warm drink. Finish: We generally finish mid-afternoon depending on weather and light conditions. Directions: The nearest postcode is KY8 5QS, though it overshoots the site. Follow the A92 then A915 towards Upper Largo, at which point you will pick up orange arrows which will direct you to the site, just off St Andrews Rd. OS Grid Ref is NO 42866 03832. Amateur Radio: For those who have it, we usually use 145.350MHz if it’s free. As we move into Spring and the weather improves, we bring you what is still a relatively NEW site for you to test out your skills, perfectly situated in the rolling countryside and offering some lovely views. Don’t be fooled though, as we’ve only been to this site once before and it was during the summer drought, so we’re hoping that this time around, it will be slightly softer ground which will make a completely new challenge! We hope this to be a popular event due to it being fairly central to most folk! Lunch: Bring your own packed lunch and warm drink. Directions: Orange arrows, will be visible from the A89 at the Harthill Rd / Heights Rd junction. You must register your attendance for full site directions. Well it’s our first event of the year, and what is now a firm favourite event to gather everyone back together, and get that competitive streak back into us. Borders Blizzard is a great event for families, kids, or anyone who fancies getting out the house and you do not need to have a 4×4 with you to enter, it can be done in a standard road car. Over the last few years, we have varied the routes, and this year is no different, offering breathtaking views on a wonderfully scenic drive. This year, we will not be visiting the Borders per se, however you will experience some of the most beautiful scenery and country lanes around West Lothian before dropping back into the West of Edinburgh. Along with a different route this year, we have added in a new element to the event, in a style not far from navigational rallies, we will have route checks along the way – involving laybys and public car parks. We will be finishing at the Ratho Park Carvery, where they do some delicious items from the menu or a regular carvery at only £5.99. You will be given a road book, with instructions and tulip diagrams – the game is simple, follow them and you can’t go wrong – unless you choose to take the wrong route! OS Map 65: 1:50,000 would potentially help you out, but don’t worry if you don’t have one as this event is designed without the need for one! If you’re a little earlier, why not try a Full Scottish or delicious breakfast roll and go for a gently wander to work it off at The House of the Binns. Not able to take part, but want to join in on the social side of it, then why not join us at the carvery from 5.30pm. Start Time: 10.00 with the first car leaving at 10.30. Mileage: 75 – 100 miles, with fuel stations near the start and finish. Event Registration: Please click here to tell us if you are coming along. At the AGM last month, not only were we finishing last year off and starting this year, but w e also brought on board new members to the committee – three to be exact! After the official business was completed, there was a prize-giving of trophies (which looked really nice in the presentation boxes), before we enjoyed a Burns Supper and for those that were staying overnight, a highly entertaining pub quiz, a few drinks and great craic! Time to get out into the fresh air and get the 4×4 engine warm for a Christmas treat and have fun and meet up with your fellow club members. 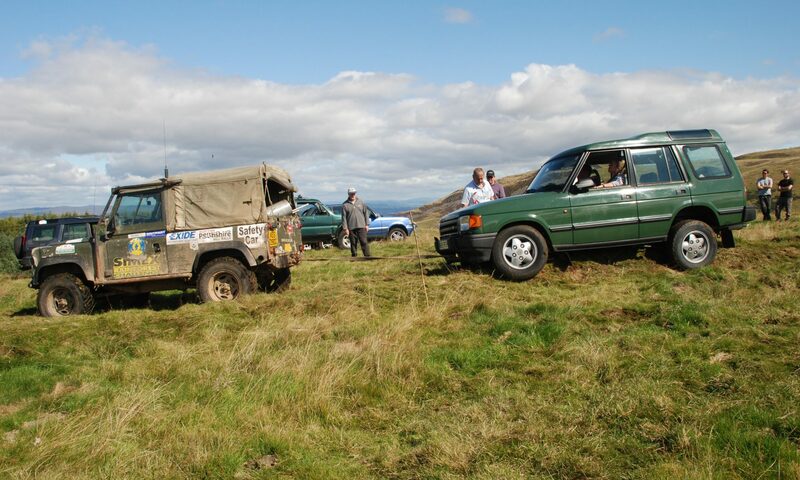 Open to all 4x4s of all levels of experience, whether road vehicles or off-road prepd. Traditionally this event was friends meeting up for a drive, however over the last 5 years, we have added in various twists, and this year is no exception! We will have a standard punch hunt setup for you to keep you amused, however don’t think that just because it’s Christmas we’re going to be going easy on you… some punches will have a pre-determined route that we would like you to take in the form of two or three trials gates. Directions: Postcode is TD1 2NP. There is a good track up to where we will be meeting for signing on and orange arrows will be out. Head for Galashiels on the A7 and you will pick up the orange arrows at the roundabout just North of Asda/Tesco and you want to be the B6374 Melrose Road. We recommend warm clothing, waterproofs, and if you have recovery or towing gear, that would probably be sensible given the time of year. This years Santa Hunt will take place at the Scottish Off Road Driving Center at Glentarkie near Strathmiglo. Glentarkie is well known throughout Scotland as one of the most exciting places to use a 4×4. The tracks are suitable for all sorts of 4×4 from the family everyday road car, to the off road prepd. For the more serious machines, there are some more serious sections within the site. There is a mixture of purpose built obstacles, along with natural terrain to give the driver a thoroughly enjoyable day out. The views from the off road course are absolutely stunning, from the top of Hangmans Hill we overlook the Howe of Fife and Loch Leven. The driving area is a natural wilderness so there is a wide variety of wildlife to see as well. This is not a winch challenge or timed event, you will simply be enjoying yourself with some good off-roading whilst on the look out for Santa(s). Bob will be hiding them this time, so you just KNOW that you will be kept busy trying to find them all day! Any Santa that you do find, can be exchanged for prizes!!! This is always a popular event, great to bring the kids and rest of the family out too… you WILL need the extra sets of eyes! Directions: KY16 7RU is the nearest postcode. OS Grid Reference of site entrance: NO 191 120. Orange arrows will direct you to the site from the A91. . It is with great pleasure, we return to Findo Gask, this time for a Punch Hunt. The site is well liked by many, with lots of great memories, however we haven’t used it in a few years. Described as a long, narrow grass site, with plenty of trees and lots of nooks and crannies for sections to keep you entertained – think a mixture between Law & Lamancha and you’ll arrive at Findo Gask. On the day, there will be punches (see picture below) set out around the site. You will be given a laminated card attached to your wing mirror (you can choose which). Upon finding a punch, you simply get your wing mirror close enough to punch the corresponding box on the card. You will also be given a handheld card to be kept in the vehicle for you to use if you find a certain punch too difficult. Sound easy? There are two types of punch – GREEN, suitable for all vehicles and RED which is slightly more difficult and may require some thinking – which is where the handheld card may come in useful. Scoring is 2 points for every correct RED and 1 point for every GREEN. This event is open to all types of 4×4, however a full driving licence must be held by the driver. Punch Hunts are a great day out for all the family, keeping everyone occupied looking for the punches – it always helps to have a passenger if you need to send them through some mud to get the RED punches! New members welcome, join online at Join SORC or on the day! 10.00 ready to go hunting. Finish – We generally finish mid-afternoon depending on weather and light conditions. Directions: PH3 1HT is the nearest postcode, with orange arrows directing you immediately off the main road. OS Grid Ref is NO NO 016 202. The easiest access is; follow the A9 south from the Broxden roundabout, and turn right (watch the traffic) signposted Kinkell Bridge. After bringing you several new sites in a row, we now return to an ole’ favourite. We will be running a mixture of both Tyro and RTV sections depending on what vehicles we have turn up. This site is well suited to beginners and Tyro sections, however we are also able to provide more trickier RTV sections at various points around the site. A tyro is the entry level trial event that SORC runs, which has the following characteristics. – Suitable for showroom condition vehicles on standard road tyres. – Has strict rules applied by the MSA to limit the range of terrain over which the course is set including slope angle and water depth to ensure any risk is minimised as much as possible. – Is designed to be totally non-damaging – no body contact with ground or other obstacles such as bushes or trees. – Open to members aged 13 and above including those who do not hold a full driving licence. Unlicensed drivers may only drive the vehicle on the specific tyro stages and must be accompanied by someone who has experience of off road trial driving. – Passengers are welcome as long as they are suitably seated and restrained. This makes tyros an excellent family event. Road Taxed Vehicle trials are run very similarly to the Tyros, but more of a test of you and your 4×4 against the course. – Full, valid license holders only for this one and the car may well come into contact with the ground and vegetation and the slopes used allow greater angles than Tyros. – Passengers are permitted in the front seats only and must be 14 or over (and in the right seat and be of the right height, etc). ANOTHER BRAND NEW SITE for you to test your skills! After the success of Blackridge and Auchterarder, we’re sure this will be another cracking site which you’ll enjoy just as much, bringing us all a new challenge! Directions: TD9 8PA is the nearest postcode, however the orange arrows, will be visible from the A698 in the village of Denholm. OS Grid Ref is NT 568 165. Saturday 11th we will be running a Punch Hunt, and the club BBQ will be lit afterwards (please BYOB). There is camping available for anybody who wants too. Sunday 12th we will be running Trials. Offering a vast spread of hill top and parts that we’ve yet to explore, this site is always a great challenge for trial events, from the simple ridge, to the quarry and valley sections, and will be just as good for a Punch Hunt. Cost: £25.00 per vehicle, £5.00 for each additional driver. This will be applied for both Trials & Punch Hunt. Directions: follow the orange arrows, which will be visible from the High Street in Auchterarder, as well as from the Gleneagles Jct. Time: 09.30 sign on for 10.00 start both days. Lunch: bring your own packed lunch and a hot drink. For those camping, the club BBQ will be available.